This toy knight comes from a rich harvest of archaeological finds, made in the mudbanks of the River Thames in London during the last 30 years. 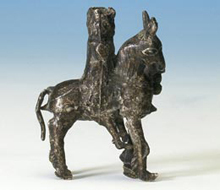 It was manufactured in about 1300, and illustrates several facets of medieval childhood. Then as now, children liked playing with toys. Then as now, they had a culture of their own, encompassing slang, toys, and games. Then as now, adults cared for children and encouraged their play. An adult made this toy and another adult bought it for a child, or gave a child money to buy it. The toy knight was made from a mould, and produced in large numbers. It probably circulated among the families of merchants, shopkeepers, and craft workers, as well as those of the nobility and gentry. The finds also include toys that girls might have liked: little cups, plates, and jugs, some sturdy enough to heat up water by a fireside. There is even a self-assembly kit: a cupboard cut out of a sheet of soft metal, instead of the plastic that would be used today. Toys give us a positive view of medieval childhood. Demography, the study of births and deaths, shows more of its darker side. The death rate among medieval children was high by modern standards. It has been suggested that 25% of them may have died in their first year, half as many (12.5%) between one and four, and a quarter as many (6%) between five and nine. There is no evidence that these deaths lessened parental affection and care for children, however, and the interest of adults in children can be traced throughout the middle ages. Medieval people inherited ideas about human life from the classical world. They thought they knew how infants grew in the womb and developed and matured after they were born. Life was viewed as a sequence of stages—“the ages of man.” Infancy up to the age of 7 was viewed as a time of growth, childhood from 7 to 14 as one of play, and adolescence from 14 onwards as one of physical, intellectual, and sexual development. Little survives about adult attitudes to children during the Anglo-Saxon period from 500 to 1066, although burials show that children were often buried with grave-goods, like adults, and that children with deformities were cared for and enabled to grow up. Information about adult attitudes grows in the twelfth century, an age of law-making in both the Church and in lay society. Making laws involved arrangements for children, because they could not be expected to bear the same responsibilities and penalties as adults. Medieval law-makers tended to place the boundary between childhood and adulthood at puberty, coventionally 12 for girls and 14 for boys. The Church led the way in making distinctions between childhood and adulthood. It came to regard children under the age of puberty as too immature to commit sins or to understand adult concepts and duties. On these grounds they were forbidden to marry, excused from confessing to a priest, and excluded from sharing in the sacrament of the eucharist. Secular justice developed a similar concept of an age of legal responsibility beginning at about puberty, although there are rare references to children receiving adult punishments. Well-established customs existed for bringing up children. Birth took place in a private chamber, where the mother was attended only by other women. This was followed by baptism, which in the early middle ages was encouraged to take place on the two great Christian festivals of Easter and Pentecost (Whitsuntide). Gradually, however, fears about the salvation of unbaptised children led to the practice of baptising children on the day that they were born, and this was the dominant custom by the twelfth century. At baptism a child was made a member of the Church, given a forename, and provided with three godparents to assist the parents in its upbringing. Forenames were sometimes chosen by parents, reflecting family traditions, but it was common for the chief godparent, who had the same gender as the child, to give it his or her own forename. As a result more than one child in a family might share the same forename. Babies were breast-fed until they were two or more, usually by their mothers except in noble families where wet nurses were employed. Gradually they were weaned on soft foods. Parents provided care and training, and records of fatal accidents to small children suggest that boys and girls soon became aware of their gender and followed their gender parent in daily tasks. Accidents to small girls often took place around firesides or wells, and those to small boys in the father’s working space. Fatal accidents were taken seriously by the authorities, and involved a coroner’s inquest, like sudden deaths of adults. Corporal punishment was in use throughout society and probably also in homes, although social commentators criticised parents for indulgence towards children rather than for harsh discipline. Children were given tasks in keeping with their ages. For younger children this meant looking after their smaller siblings, or running errands. As they grew older they might be allocated lighter domestic or agricultural duties, but they were not capable of doing serious work until about the age of puberty when they began to acquire strength of an adult kind. Medieval childhood was a rich and varied state, since children varied from one another as much as adults did. It differed chiefly from modern western society in its mortality and in the fact that many young people started serious work at an earlier age. Most of what we associate with childhood, however, existed for children in the middle ages: upbringing at home, play, special treatment according to age, and training for adult life and work. The concentration of historians on adults in the middle ages does insufficient justice to the fact that about one third of the population was usually under the age of 14. Adams, Gillian. “Medieval Children’s Literature: Its Possibility and Actuality.” Children’s Literature. Vol. 26 (1998): 1-24. Crawford, Sally. Childhood in Anglo-Saxon England. Stroud, UK: Alan Sutton, 1999. Hanawalt, Barbara. Growing Up in Medieval London. New York & Oxford: Oxford UP, 1993. ---. The Ties that Bound: Peasant Families in Medieval England. New York & Oxford: Oxford UP, 1986. Orme, Nicholas. Medieval Children. New Haven & London: Yale UP, 2001. ---. Medieval Schools. New Haven and London: Yale UP, 2006.